Is Your Vocabulary Greater Than Shakespeare’s? We came across a nice site that tests your vocabulary in a short ‘quiz’ (of sorts) that takes only a few minutes to complete. It’s an interesting little test, because it will calculate (by which we really mean ‘estimate’) your vocabulary, or total number of words which you could practically use in conversation or writing. A bellibone is an old word for (we’re quoting Samuel Johnson’s Dictionary here) ‘a woman excelling in both beauty and goodness’; it appears in Edmund Spenser’s Shepheardes Calendar in the late 1570s. An ultracrepidarian is someone who gives opinions on things they know nothing about; the word first appears in the writings of the essayist William Hazlitt in the early nineteenth century. An agathist is ‘a person who believes that all things tend towards ultimate good’. So if you’re tired of using the near-synonymous ‘optimist’, what about this handy alternative? In his 1818 novel Nightmare Abbey, Thomas Love Peacock coined the word antithalian – meaning ‘opposed to fun or festivity’. Pandiculation is the act of stretching and yawning as a sign of weariness; it is first recorded in a dictionary from 1611. Are there any rare words you think should be better known? Anyway, to the vocab test. We shared the test with our followers on Twitter earlier today, and you can see the range of results in the @ replies we got. So, what will be your score? How many words do you intimately know? Here is the link to the site, Test Your Vocabulary – be sure to let us know the extent of your word-knowledge! 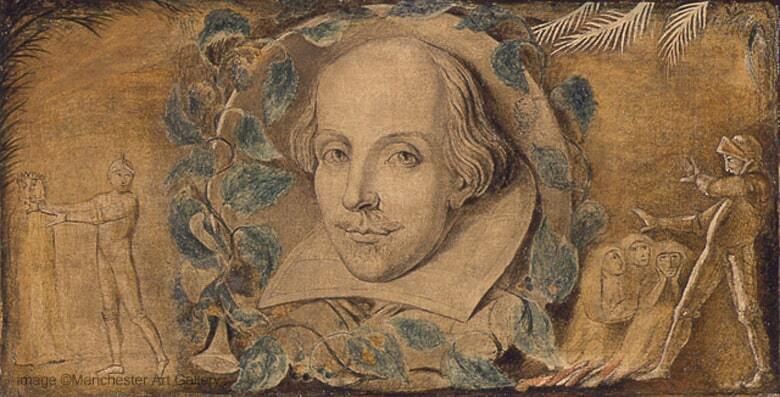 Image: Shakespeare by William Blake, public domain. Fun for authors . . . Some of these are gems! I might just have to work some of these into my vocabulary. Took the test and can’t believe it is at all accurate. I do have a large vocabulary, or it seems: people frequently say so – but not so large as the test suggests. Moreover, Shakespeare’s vocabulary was not restricted to the words he used in his writing. The list above is great and I’ll work some of them in somewhere…would not want to be thought antithalian, and definitely not ultracrepidarian. I took the test and the result surprised me. The number of words I know seems too high for a foreigner & I stumble upon a lot of words I’ve never seen. It is always fascinating how we play with language and constantly invent new words. A great browse is the Oxford English Dictionary to follow the amelioration and pejoration of words since their inception. This is so marvelous! I took the test and come out at 28,500 words! An interesting test, which, as usual, does not seem to apply to me. English is indeed my second language, but not by much; my family moved me here at the age of 2 1/2. I can’t conakitschulate any rare and unusual words at present. But your interesting posting has certainly got me incloperulating. I was disappointed at 23k..sigh..not bad for someone who has english as a seconf language. Interesting new words! Thanks for this. I had no idea how I would fare on the test but was surprised to find I know 34,800 words. Mind you I think I probably only actively use about half of that. Re. Is the word anti-thalian(Peack) borrowed from Rebelais’ work where Thélème stands for full and free development of the senses? ‘Ultracrepidarian’ is bound to come in handy! Right, off to take the test……………. Well I did pleasurably well on that – though I wondered whether the test might not have been more accurately done (at least where it really narrowed down, to presenting a reasonable range of multiple choice questions on meaning. Because of course you might be pretty sure you know the meaning of a word, but could be wrong. I suppose I should have checked the dictionary with words I was fairly sure i knew the meaning of but had a hesitation about. Because (as with ultracrepidarian!) looking at the various pieces which make up a word, meaning seems to be implied – but might not be! I took the test, 29,300 words. Not bad. I thought I knew more considering that I read a lot. Interesting blog. I never thought of guesstimating how many words I know. I agree with Lady Fancifull though. To get a better idea of how many and how well you know, a test with multiple choice questions would have been better. I suppose that’s a project someone else will pick up. A nice little quiz to energise your Sunday afternoon. ‘An ultracrepidarian is someone who gives opinions on things they know nothing about.’ A useful word in the context of the discussion of language. I’m going to have to remember ultracrepidarian. I made 30,700. Not bad, I suppose. Great words! I meet with some like-minded logophiles at least once a month for our “word luncheon” during which we all four share at least two new words that we’ve picked up since our last meeting. Our challenge is keeping the number down to two! Anyway, this week I’m sharing bellibone to describe the three females in our little group. Fun! Many thanks for stopping by my blog and tapping that ‘Follow’ button. I appreciate it. Reblogged this on anything Cinema.